Wow! We've had a busy couple of weeks! We had two weddings on Saturday April 4. Unfortunately we could only attend one, so we attended Asad's brother's wedding. Family first! The wedding combined two cultures and traditions and that is always fun! I had a great time doing henna on the bride Thursday evening. Jillian is a bit shy so I did a more subtle design that was not overly large, but still lovely. As tradition dictates, I hid the groom's name in the henna for him to find on the wedding night. Friday was the Mehndi Party! We got to dress in traditional salwar kameeze and there was great food including my favorite, samosas with mango chutney. The sisters got together to steal the grooms shoes and force him to pay us to return the shoes. This is an old tradition that is always a highlight of the party! The guests took turns applying henna to the hands of both the bride and groom while wishing them luck and blessing them with money. The money collected during this portion of the ceremony is donated to the charity of the couples choice. I'll have to find out what charity they selected. In order to combine the two cultures and traditions some combining had to be done, so the nikah (Islamic wedding ceremony) was also preformed during the mehndi party. Saturday was the traditional American wedding ceremony and reception at a lovely hall in Mt Dora. It was beautiful, as you can imagine. The wedding we had to miss was our friends' Angie and Shaun who got married in a castle in St Augustine and held their reception at the San Sebastian Winery. The pictures are stunning and everyone seemed to have had a great time! The bride and bridesmaids all wore khussa during the reception! Ange said by the end of the night her corset was killing her, but her feet were in great shape, lol! The honeymoon is in Hawaii so Angie stopped by for some honeymoon henna before the trip. Congratulations to both happy couples! 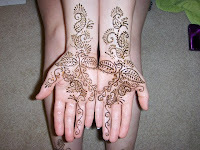 I hope your henna imparts the blessing of love, happiness, and FUN!